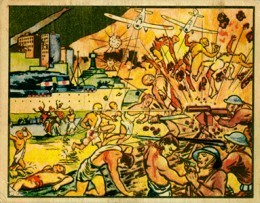 1938 Gum Inc. Horrors of War is one of the most famous trading card sets of all-time. Equal parts gruesome and gorgeous, the historically based set remains widely sought after decades later. In many cases, the most popular trading card sets are also some of the most controversial. In 1962, Mars Attacks created a stir as aliens invaded Earth, wrecked havoc and shot dogs. More recently, Garbage Pail Kids and the satirical spin on gross-out humor saw them banned from many a classroom. But if you want to trace the history of the hobby's most notorious set, you need to go back to before World War II. 1938 Gum Inc. Horrors of War created a stir in the mainstream media at the time of its release, but it also grabbed the attention of America's most powerful man -- the President. 1938 Gum Inc. Horrors of War is a large set -- 288 cards divided into two series. The original set has 240 cards that focus on the Spanish Civil War, Ethiopian War and the Chinese-Japanese War. The final 48 cards came later as a supplemental release. Among these cards are three that show Adolf Hitler, who was now a threat to the world. The images on the front are full of color and detail. Many of the images are shocking, even today. Nothing is held back. Scenes of torture, bloody battlefields and children under attack are all shown in the set. The colors are vibrant, further adding to the set's distinct visuals. Backs offer detailed descriptions of what's happening on the card. The writing is equally lively and colorful. Cards measure 3 1/8" by 2 1/2". Besides packs, a factory set of the first 240 cards was also produced. According to Dean Hanley of Dean's Cards, the trading cards got an endorsement from President Franklin D. Roosevelt. He allegedly used the cards to show people some of the horrific things that were happening overseas. At the time, America was still recovering from WWI and there was little support to get involved in the increasing unstable environment overseas. And while some politicians mocked Roosevelt, the attention helped push the set's popularity to new levels. 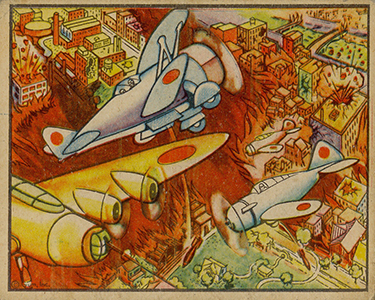 1938 Gum Inc. Horrors of War continues to resonate today. Cards continue to command strong prices, no matter the card's condition. Historians can look to the cards to debate their place as a propaganda tool and how they shaped sentiment among the young people and the general public. While there's much to debate about the set, its status as a premier set in the hobby isn't one of them. 1938 Gum Inc. Horrors of War R69 #2 - #115 - Complete your set. Pick your card. 288 cards total. Final 44 issued after as a "More Horrors of War" expansion. 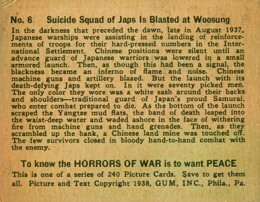 172 Japs Drive Against Chinese "Pill Boxes"
216 Wartime "Castel in Spain"
236 Rebels And Allies "Celebrate"
251 Devil-Worshiping Koreans View "Dog Fights"
252 Russian Tank Commander Is "Purged"
288 Czech President Surrenders as Mobs Cry "Fight"
I found these cards in a box of my deceased husband and was wondering if they are of any value. I have about 45 cards, starting with #1 and ending with 173. nIs there any interest in these cards and what can I do with them? What shape are they in and how much do you want for them?